With a deep love for community and growth, we set out to build an event that would be accessible for everyone. The Fields of Yogis family has been to festivals high and low. Yoga festivals, street festivals, music festivals. So we decided to take all of those features and put them together. During the first year we thought about what we truly wanted at the end of the day. We decided that community, growth, accessible pricing, health, and mental wellness were central to our ideal festival. After that we decided to take a holistic approach to programming . We wanted yoga of course, but we also wanted empowerment workshops, group art, live music, and community oriented projects. The mental and physical health benefits are immeasurable. The most important aspect was that we give the new yogi a baseline to practice with and the expert a set of new tools to refresh their practice. Cedar Rapids was a ghost town after the flood in 2008 but it’s been amazing to see the people and businesses rally around each other and build. 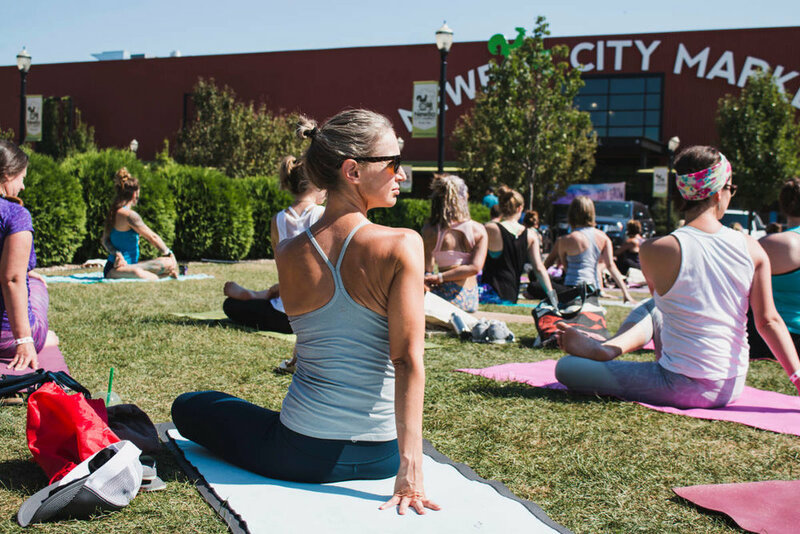 With that, Fields of Yogis saw the inspiration, watched the beautiful growth in NewBo District, and decided that we wanted to be a part of it all. t is so exciting to see a community that has been battered and beaten down, become so vibrant and robust. Our hope for the festival is that we can teach everyone the benefits of yoga, help in the success of our community, and build right along with it. Anyone and everyone can do yoga. It is about soul and practice, not about perfection and expertise. Our Grand Opening celebration was Oct. 21st. It was a blast and it was so cool to see all the local yogi's come together. Mystic Chocolate was here giving out samples of their Chakra Chocolate, Kae Apothocary was also here showing off their fantastic line of all natural, healing products. Mega Good Vibes offered Hena Tattoos, Awful Purdies played music and Daniel Tardy led Acro Yoga demos. We are so grateful to being doing what we love here and blessed by our community for the support. Thank you for coming to the party! We did yoga on the roof of Water Tower Place in New Bo throughout the warmer months and will do it again come Spring. Thank you to Ann Fleckenstein for organizing, Revolution Realty for the support, the residents of Water Tower Place and all of the yogi's who participated. It's an amazing and uplifting experience! We had an end of Summer celebration in Green Square Park. Fannie Hungerford taught a dreamy class, we moved with mantra and learned about Para Yoga, the type of yoga she studies. It was really cool! After wards we broke bread or rather ate kale together and it was fabulous. Ann Fleckinstein took the photographs. Click on the image to see the next photo.